AMVETS Post 2 is named for Major General Thomas P. Carroll who, at the time of his death at the age of 45 in March, 1964, was the Adjutant General of the Alaska National Guard. At the time of his death, he had served longer than anyone else in the post of Adjutant General. Major General Carroll had flown to Valdez with then Governor William Egan from his home in Juneau (where he had resided since his appointment to the post of Adjutant General) to survey damages there resulting from the Good Friday Earthquake in March of 1964. Shortly after taking off from Valdez to return to Juneau, the C-123 cargo plane he was a passenger on suddenly and inexplicably plummeted into Prince William Sound. Killed with the General were the pilot, Lt. Col. Thomas Norris; the co-pilot, Maj. James Rowe and flight engineer TSgt Kenneth Ayers. Major General Carroll was born in Edgemont, South Dakota. He entered the Army and served as a Lieutenant in World War II, taking part in the Normandy invasion and the Allied advance cross France. While training for and awaiting the invasion of Normandy, he met his future wife, Kathleen in Londonderry, North Ireland. They were married December 13th, 1942 in Armagh, North Ireland. His wife, Kathleen waited while he participated in the Normandy landings. Lieutenant Carroll was later cited for bravery in action against a German machine gun platoon. His company came under heavy fire, and Lieutenant Carroll, being on the company’s flank and not so exposed to the machine gun fire, stood up and wiped out the machine gun platoon. He was nominated for the Medal of Honor, but the decoration was downgraded to a Silver Star. He was later wounded and returned to the United States for hospital care. After being discharged from active duty in 1945 at the end of World War II, Thomas Carroll moved to Anchorage with his wife, Kathleen. Thomas Carroll then joined the National Guard and as a Major was picked by former Governor Mike Stepovich to take over as the Adjutant General of the Alaska National Guard in 1957. He was swiftly promoted to Colonel, and then later Brigadier General and Major General. When William Egan took over as Governor, he retained General Carroll as Adjutant General. 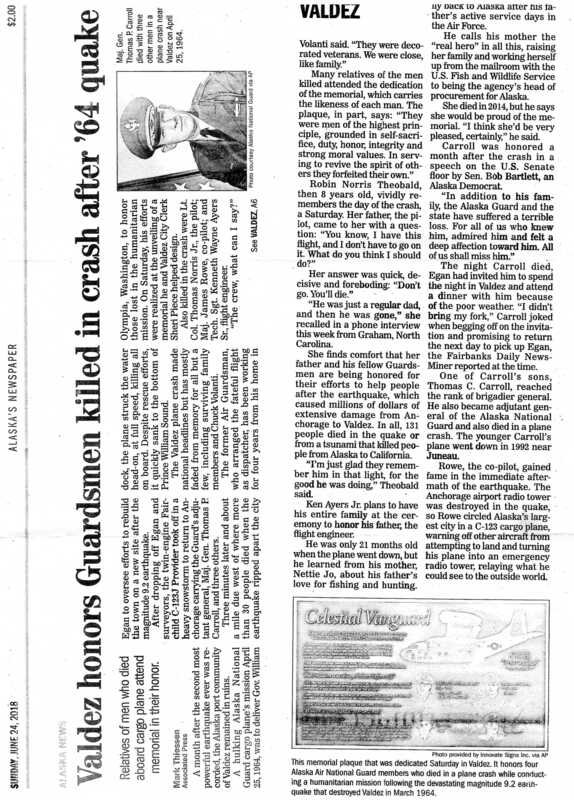 Major General Carroll was survived by his wife, Kathleen (who passed away at the age of 79 on August 24th, 2001), his sons Mike (16), Thomas C. Carroll (15, who later, as a Brigadier General and Adjutant General of the Alaska National Guard perished in the crash of a C12 aircraft enroute to Juneau), and his twin 14 year old sons Bill and Kevin.